St. Martin's Press, 9781250072306, 288pp. The New Grand Strategy tells the story of a plan, born within the Pentagon, to recapture America’s greatness at home and abroad by elevating sustainability as our new strategic imperative. It aligns our enduring national interests of prosperity and security with a new framework that addresses pressing economic, social, and environmental issues at home, tapping into a trillion-dollar market demand for walkable communities, regenerative agriculture and resource productivity. It is an inspiring vision of what’s possible when Americans hold a collective view of the future and come together to bring it to reality. Released during one of America’s most divisive presidential election campaigns, The New Grand Strategy avoids the partisan rhetoric dividing our nation today. Instead of placing blame, it offers a clear, pragmatic plan that can unite Americans and launch a new era of prosperity and security. Mark Mykleby is a senior fellow at the New America where he continues his work on grand strategy and sustainability. He was a second lieutenant in the Marine Corps and co-authored with Navy Captain Wayne Porter A National Strategic Narrative. Patrick Doherty is deputy director of the National Security Studies Program and director of the Smart Strategy Initiative. 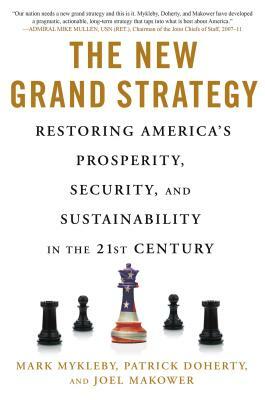 Joel Makower is chairman and executive editor of GreenBiz Group and author of more than a dozen books, including The New Grand Strategy, with coauthors Mark Mykleby, Patrick Doherty.